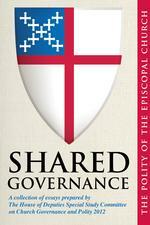 Shared Governance: The Polity of the Episcopal Church is now available from Church Publishing and Google Books (with preview) and is making its way into the hands of Deputies to the upcoming General Convention. The volume is a collection of essays by members of the House of Deputies Special Study Committee on Church Governance and Polity, appointed by President of the House Bonnie Anderson after the 2009 General Convention. I had the pleasure to be the chair of the committee and to work with the members to produce this resource. The essays cover the history and theology that underlies a system of church governance in which decision-making and implementation is shared among all church members, lay and ordained, at every level from the parish to the General Convention. Essays focus on the two Houses of the General Convention, their origin, structure, and interaction; on the role of the presiding officers of each House, and how their offices have changed and evolved since their creation; and on the Executive Council and the other committees, commissions, agencies and boards that function in the periods between sessions of the General Convention. There is also a brief essay on the wider Communion and Church. The collection is intended specifically as an educational and reflection tool for Deputies to the General Convention, and offers a number of insights particularly geared to their work; however, any Episcopalian wanting to be better informed about how and why our church came to function in the way it does will find the essays helpful. Throughout the collection, effort has been made to provide an accurate perspective for the reader, and to dispel or correct some of the prevailing mythology concerning the origins and practice of our shared governance. I have taken the opportunity to read through the google preview of this book and have found it to be of exceptional interest and value, especially in light of our catholic Communion's ongoing discussion about governance. PLEASE tell me that there is an ebook version of this text which is quickly forthcoming. I principally use my tablet as an e-reader, so that's not a problem. I'm very pleased to hear this and am excited about getting my hands on a copy of the book for both myself and to suggest/lend to others within our Communion. Thank you and the others who have made such a fine and informative document. Google states on the page regarding this book that there is no ebook available, so perhaps in the future. I have apps on my iPad for Apple's iBooks, Kindle, Kobo, Nook and Google. So you have access to all of these ebook sources on an iOS device. Thanks Bro David. Church Publishing made its whole "line" available on Google Books, and I know that the plan is to do the same with all new titles, but that may take a while. The print edition just came out (got my copy Wednesday), I'm not sure what is involved in going from pdf to Google. But I do know this is planned.